Location,Location,Location! This stunning mid-century designed complex offers incredible direct ocean, Catalina Island, Queen Mary, marina, Bluff park and coastline views! Enjoy the sites and sounds of the blue Pacific Ocean from this beach front residence located on the sand with direct beach access! Gleaming wood floors, floor to ceiling windows, a terrific corner location with a HUGE oversized deck make this a must see! You can walk out your front door to all of the shopping, dining and entertaining afforded by nearby Belmont Shore,2nd Street, the pier promenade, the 7 mile bike/pedestrian path, and not to mention Bluff Park! Whether strolling along the beach, the park, or just wanting to take in the sights and sounds of the ocean, that will be your backyard, this home offers it all! Rarely available complex and secure gated parking included. Complex also has free community laundry and low HOA dues in addition to having just installed new high end dual pane windows throughout and currently finishing a full exterior renovation. 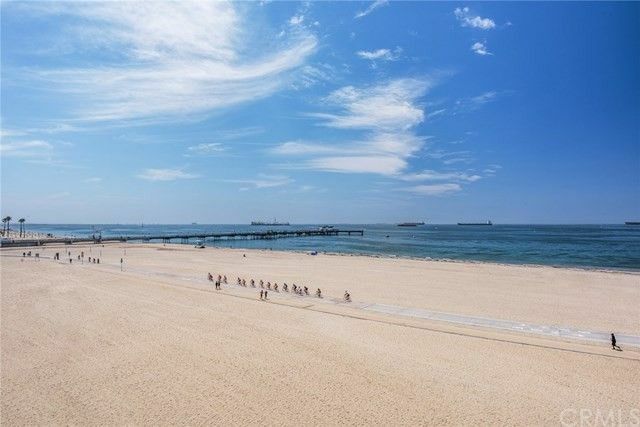 This is an opportunity not to miss and offers a rare opportunity to own beach front property along Long Beach's famed Ocean Blvd. strip!